Experience the quality of Gibson Steel Fabrication and their full line of Gibson Steel Basins and Custom Grating Fabrication. The Storm Water Catch Basin is a single chamber metal device to collect rainwater runoff into the storm water drainage systems. 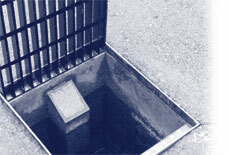 These devices are constructed with traffic rated grating and a hinged trap arrangement that allows sediment to be trapped in the device, thus allowing water to exit through the outlet to the drainage system. The Sand Collector is a double chambered device that allows a higher degree of sediment removal. Both devices have available a removable filter basket that contains a filtering medium just under the storm water inlet ( Catch Basin ) grate. The runoff flows into the grate through the filter where oil and grease are removed and into the drainage system. The filter is non-leaching and can be disposed of through normal trash removal. Uses of these devices range from parking lots and car washes to residential areas. Click on an image below to view a pdf of a sample diagram.